I recently got a smartphone, which I extremely enjoy. Having the ability to get email while on the road is awesome. It really helps you to stay connected. As one person said to me, it is very liberating, in terms of allowing you to get away from your desk and not feel like you are missing anything. In addition to email I use it as my cell phone and enjoy the browser for checking mostly news and sports related information. As a side activity, I like to try and jog several days a week. For whatever reason, I feel more comfortable having my cell phone, now smartphone, along with me, just in case anyone needs to reach me. I'd really like to locate an ideal carrying device for this that will help keep it protected from sweaty hands, bad weather, being dropped, etc. Please feel free to comment if you know of any such item and it has worked well for you. 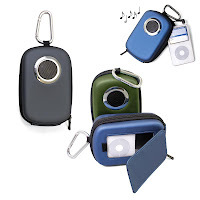 As a related item, you might like to check out the Melody MP3 Case with Speaker which we carry at CoolStuffForDads.com. Not really a fit for what I am looking to do currently, but might be of interest to some buyers. It is an insulated, MP3/MP4 case with speaker and carabiner clip and runs on 2-AAA batteries.